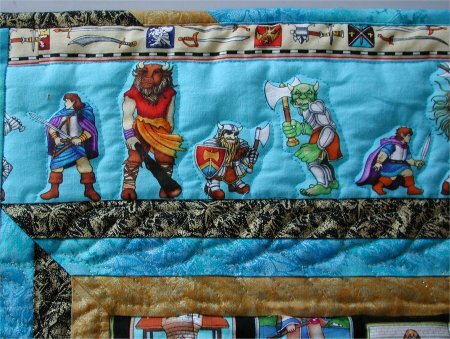 The other UFO that I have finally, finally finished ... as in COMPLETELY done ... is my middle daughter's Wizards & Warriors quilts. The top & backing were done earlier this year, however, sandwiching and quilting needed to wait as other Real Life events got priority. But finally, the weather and circumstances cooperated so I was able to spray baste everything together. 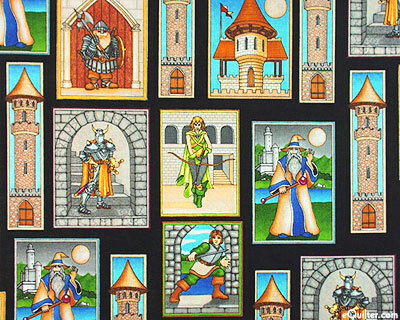 It all started when I discovered Michael Miller's "Wizards & Warriors" fabric line. The colors! The designs! The everything! I loved it. 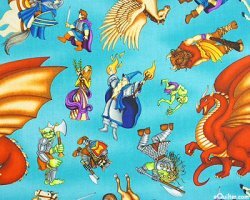 My middle DD, Lisa, is also very much into fantasy and I knew she would love this fabric. 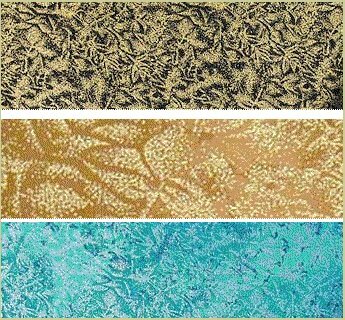 Through the power of the Internet, I was able to find every single companion fabric for the entire line .. a task that would have been impossible if I was limited to local quilt shops. The main frustration was that I was buying fabric for a quilt whose design & layout was unknown ... so I simply bought "a bunch". I used Michael Miller's "Fairy Frost" (gotta love that stuff!) as coordinating solids. Step 1. 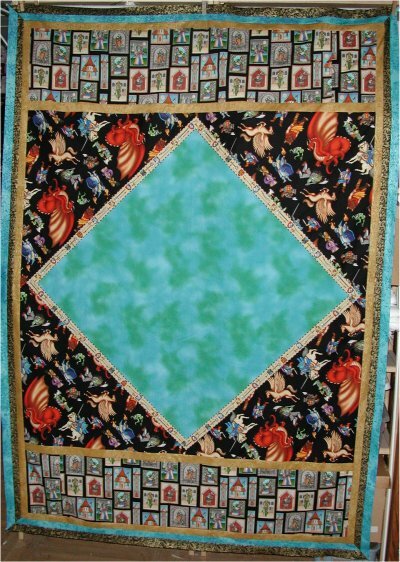 The main fabric has a turquoise background w/ the figures tossed all over. One of the figures is a large, red dragon. 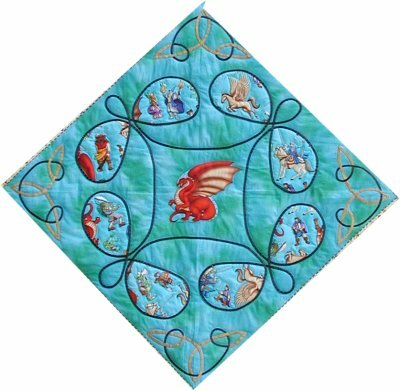 I wanted this fabric as the central medallion and the dragon in the middle of the medallion. 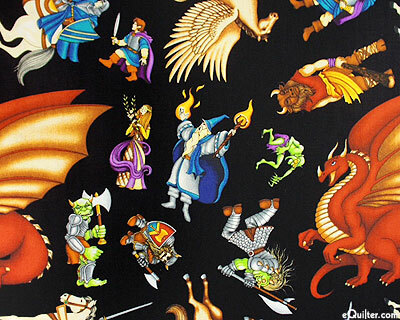 However, the way the figures were printed on the fabric didn't allow me to center the dragon, so I paused to regroup. 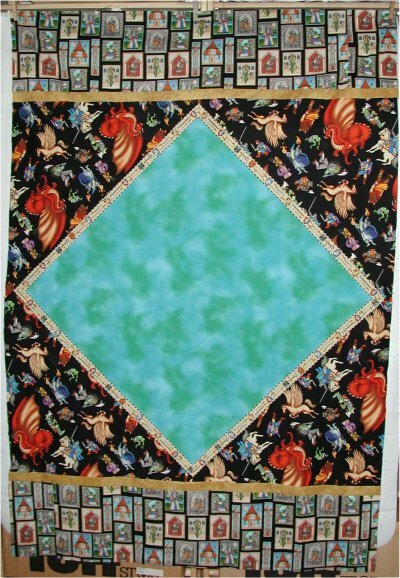 It just so happened that I had purchased, with the intent of making MYSELF a shirt, some mottled turquoise fabric. It was the exact shade of the background. Ahhh.. what the love of a mother won't do for her kids! [insert dramatic scene] I sacrificed MY shirt fabric to be in Lisa's quilt! This picture is of the completed center medallion. The Celtic knotwork applique wasn't done until the top was completed so the rest of the picturs will show just the mottled turquoise fabric - the blank canvas. The intent was to scatter fussy-cut figures over my shirt fabric, but it didn't look quite right. After thinking some more, we decided that a Celtic knot design with the tossed fabric used as inserts would be a good compromise. Lisa found a design that she liked and that I knew would work and that became the central medallion design. 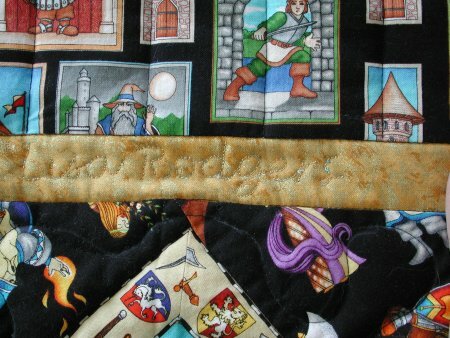 Step 2: One of the companion fabrics is a ribbon stripe ... repeating bands of figures separated by a decorative narrow band. I cut the narrow band from this ribbon stripe and sewed it onto the perimeter of the on-point medallion. Step 3: Then came the large setting triangles. These came from the tossed fabric, but on a black background. Step 4: Top and bottom bands of gold Fairy Frost came next. 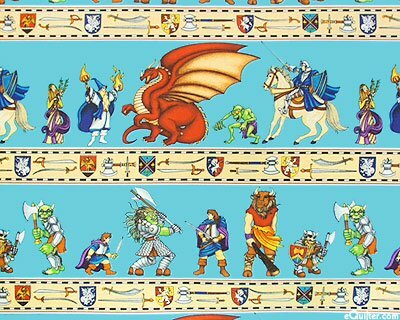 Step 5: Then, another set of top & bottom bands, this time of a companion print .... small snapshots of fantasy figures and buildings . Step 6: Then borders all around of all 3 Fairy Frosts . Step 7: Another set of top & bottom bands of the repeating figures (which were part of the ribbon stripe)used in Step 2. Step 8: Close-up of the top band with yet another ribbon stripe. Step 8: The final border was made from crosswise segments of the ribbon stripe on black background fabric. All the short crosswise segments were then sewn together to create a vertical border for the sides. 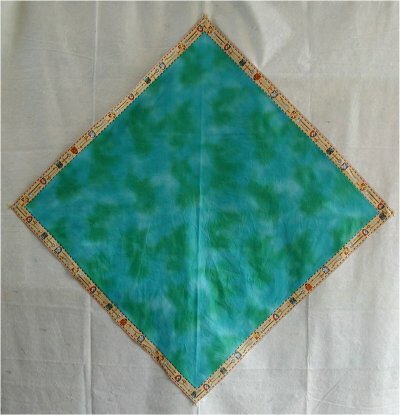 The top was completed with cornerstones of the mottled turquoise fabric also used in the center medallion. The backing is similar yet different. 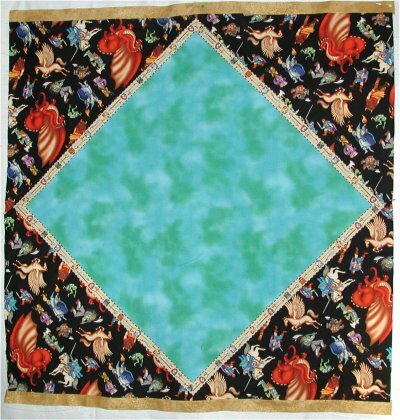 I used the remainder of MY turquiose shirt fabric (a very large rectangle), sprinkled fussy-cut figures all over it. 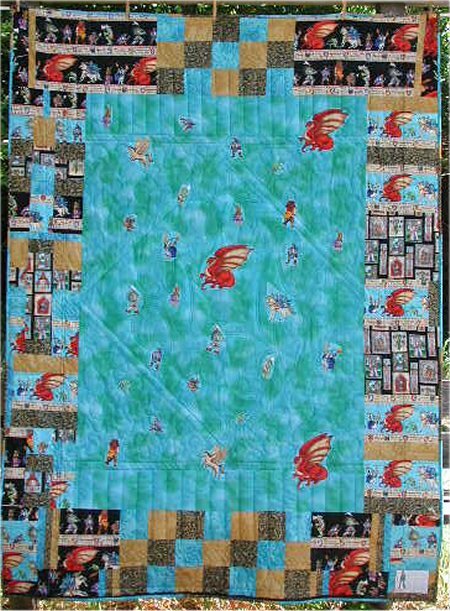 Around this rectangle, I made borders of the leftover fabric to fit the spaces .... sewing together different companion fabrics and the Fairy Frost solids. 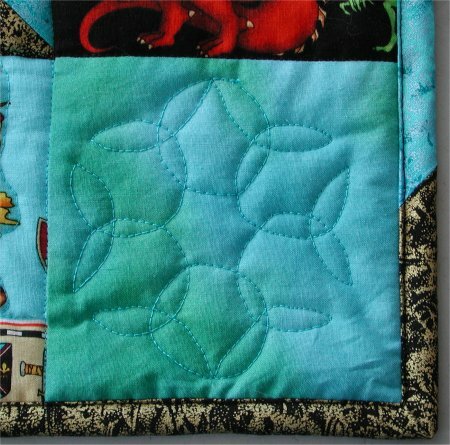 The quilting is very simple .... it needed to (obviously) hold the quilt together but NOT be obvious. 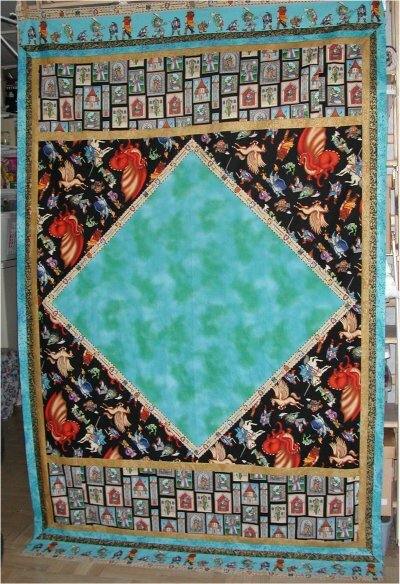 The purpose of the quilt was to show off the *fabric*. 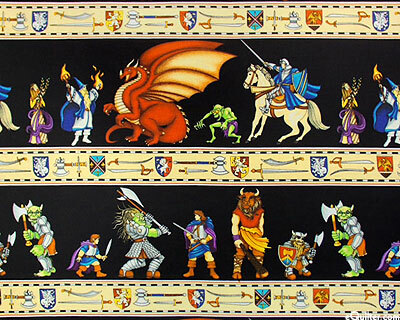 Therefore, there was a lot of stitch-in-the-ditch; a lot of straight line stitching between the printed ribbon stripes; a lot of outline stitching around the fantasy figures and a large scale meander in the black setting triangles. 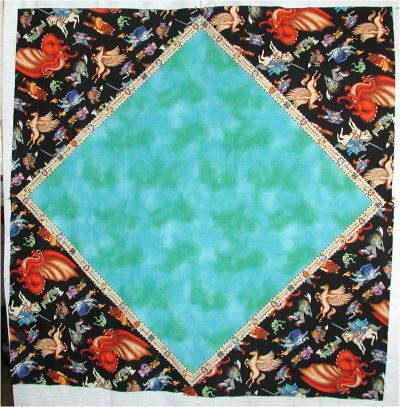 The tri-color borders got a continuous line leafy motif .. one of my favorite quilting designs. 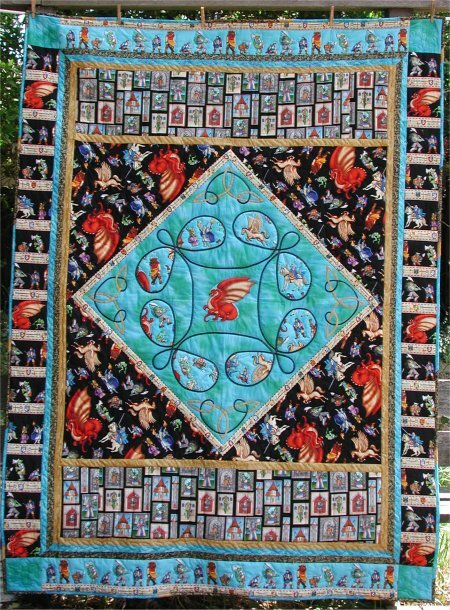 The gold fairy frost border was quilted with Lisa's name. I discovered that it is best to actually write out the name (phrase/word) on paper first and write it more widely spaced apart than you would normally do. I scanned the written name and sized it to fit the space. Spray adhesive temporarily stuck the paper to the border as I stitched right through the paper; it easily tore off afterwards. The cornerstones got a special Celtic inspired design. 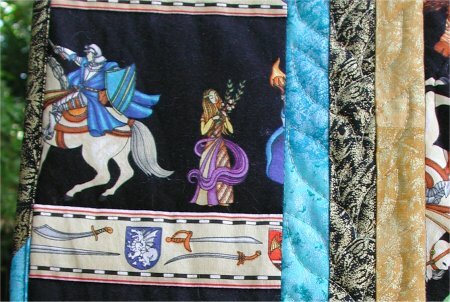 The bias binding was done from a strip set of the 3 Fairy Frost fabrics. Lisa is *thrilled* with her quilt and I am *thrilled* to have another UFO crossed off my list!